This was the third time that these two Othello giants met in a WOC final. 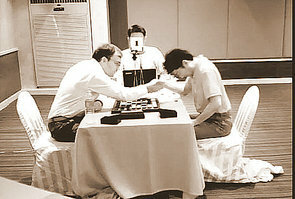 Makoto Suekuni (JPN) won the World Othello Championship 1997 in Athens. 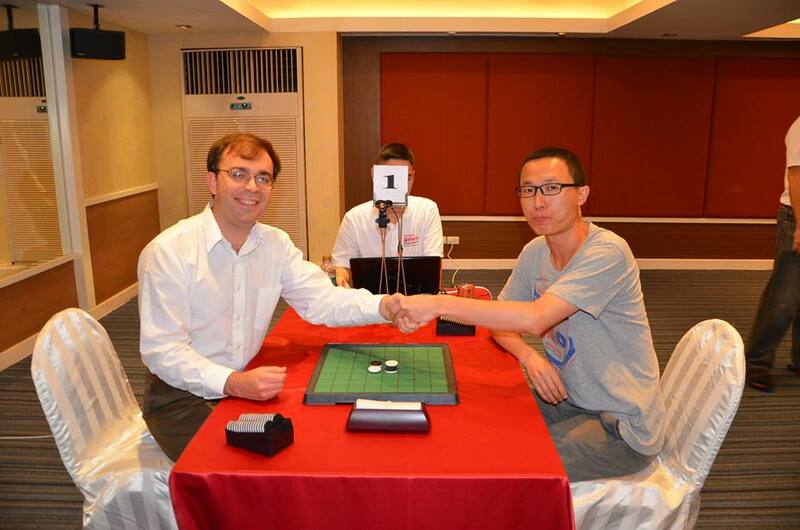 He defeated Graham Brightwell (GBR) in the final 2 - 0. He was runner-up in 2003, 2004 (lost finals against Ben Seeley (USA)) and 2006 (lost final against Hideshi Tamenori (JPN)). In 2009 he lost the semifinal against Matthias Berg (DEU) but won the playoff for third place against Masaki Takizawa (JPN). 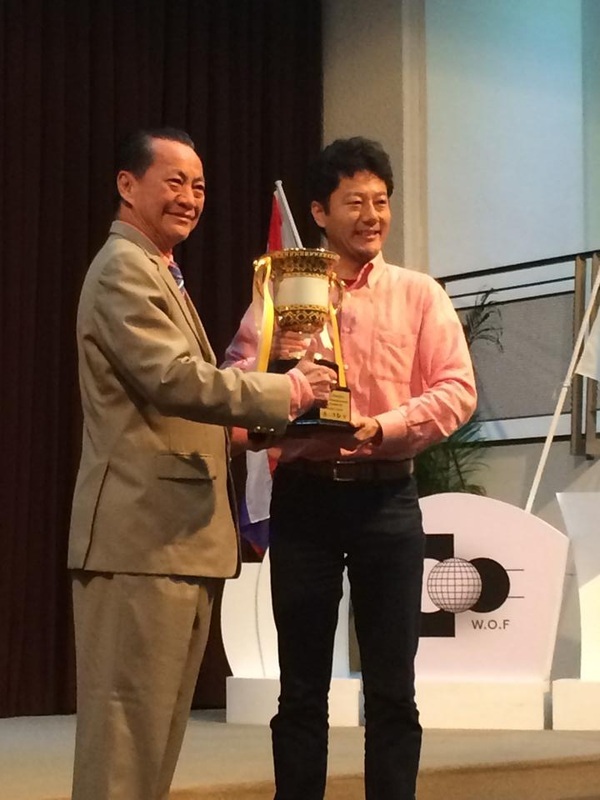 Finally, 17 years after his first WOC victory, the most prestigeous title in the Othello community has been reclaimed by Makoto Suekuni. 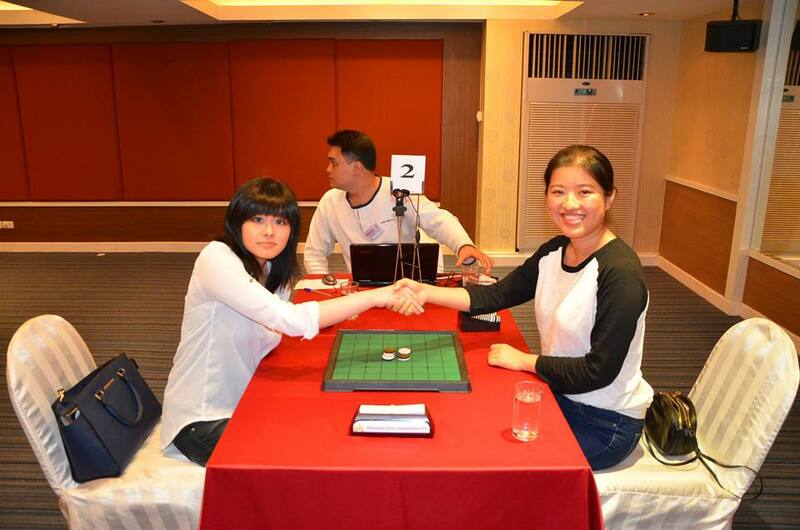 Makoto started 2014 with a victory on January 3, 2014, at the Shinagawa New Year's Cup. 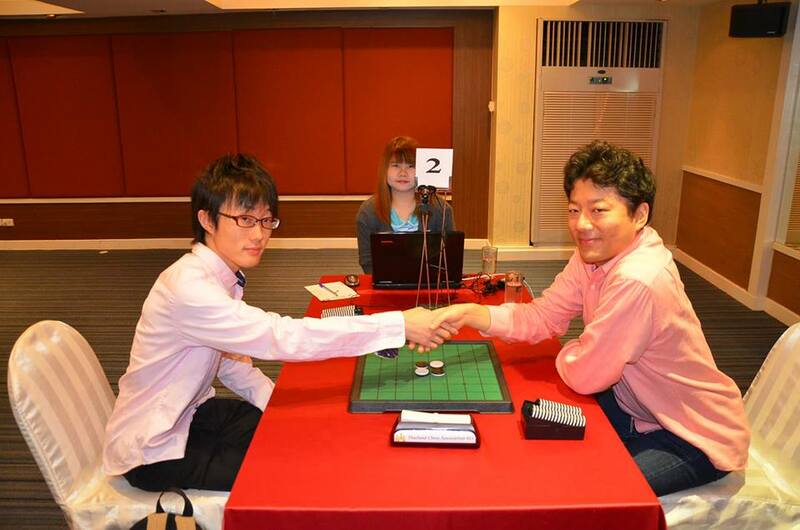 He won the 35th Meijin-Sen in March and the 92nd Shinagawa Seaside Open in May. And now in November he holds the WOF CUP. Congrats Makoto!! Congrats Makoto Suekuni, well played!! Ben Seeley: "Othello is still my hometown"
Actually, the biggest news for my life in the last few days was the birth of a son to my youngest brother and his wife. So, my brother got his 2nd (child), and I got my 2nd (place). I didn't want to forget to mention my happiness about the more important 2nd . OK, so let me tell all the non-Othello people the backstory on the Finals for the WOC, and the story of the time a man decided to not give up, and he managed to change his pattern for the better. 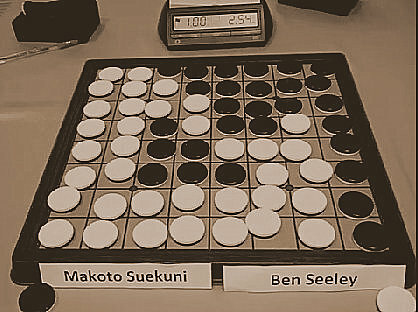 In 1997, three years before I started playing Othello, a young player from Japan named Makoto Suekuni won the World Othello Championship. He had been an Othello prodigy from a very young age, and his play was creative and brilliant. Most people that I talked to said they had considered him to be the best player in the world at that time, and they thought that as he got older he might set the record for number of World Championship victories. Makoto was also tremendously fun, and he enjoyed entertaining everybody and helping to promote the great game of Othello. So, he was well-liked, and he had a lot of fans. I liked him a lot, too. 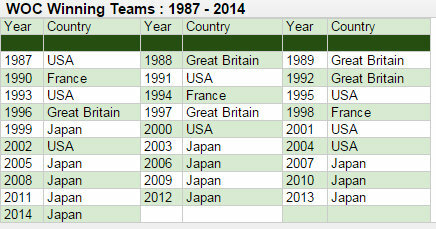 However, it is maybe ten times harder to qualify for the Japanese team than for any other team, and back around 1997 I think it was even harder. There were only one or two qualification spots available for a player like Makoto. In order to promote Othello, Japan set aside team spots for people who promoted the game, or for the strongest qualifying woman or child, etc. 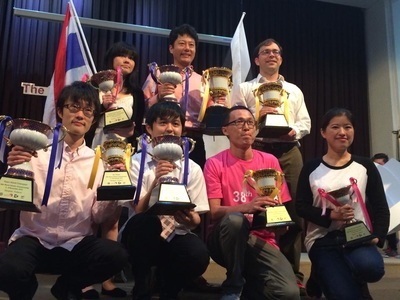 Also, in order to get the team spot a Japanese player basically had to win every single game of an extremely tough and deep qualification tournament. 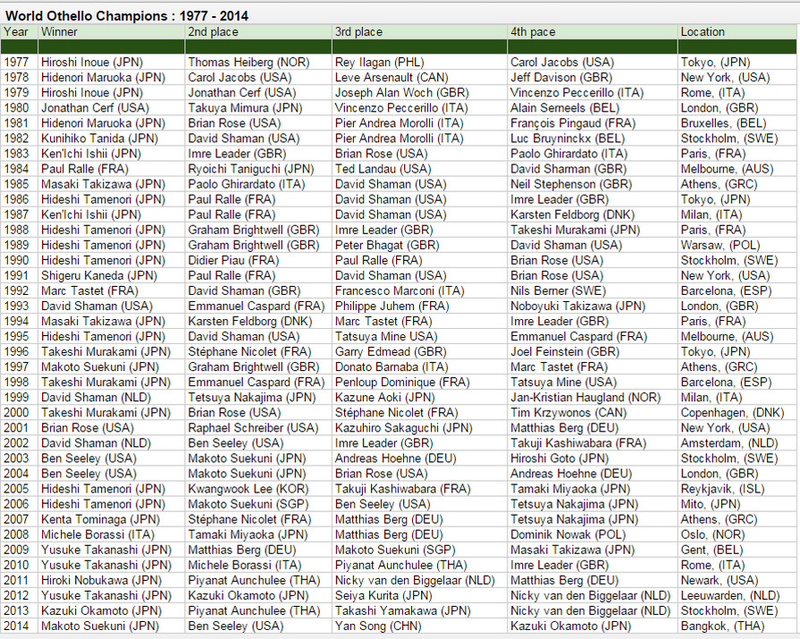 Even a player who was clearly the best player to enter the tournament would have very low odds of winning. 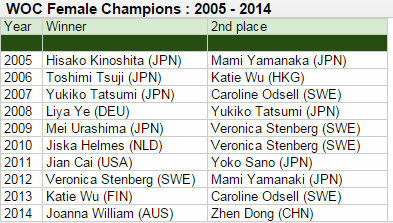 So, Makoto didn't get to return to the WOC until 2003, and of course most players believed he would win the WOC again. In 2003, I lost to Makoto Suekuni in our game on the first day of the qualifying section of the tournament (the two days of play which decide the four players who qualify for the semifinals), but I finished 1st in the standings, and he finished 2nd. Then after I won the semifinal with the 4th place player 2-0, I beat Makoto 2-0 in the finals. There was a bit of shock about this. In 2004, it was the same pattern- I lost my game with him on the first day of the qualifying portion of the tournament, but I finished 1st in the standings, he finished 2nd, I won my semifinals undefeated, then I beat him 2-0 in the finals. We never met again in the WOC playoffs after that, although I beat him in a couple more tournament games, one of which was a decisive game for me in the tournament. 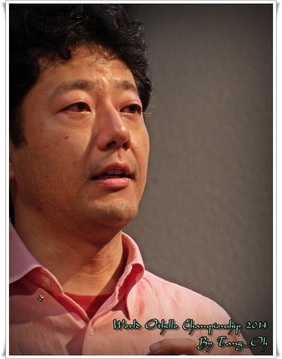 He also made it to the finals in the 2006 WOC, where he lost to Hideshi Tamenori in three games. He also had a few years where he barely missed qualifying for the WOC, placing 2nd or 3rd in the qualification tournament. So, he had spent 17 years repeatedly missing out on the biggest prize he wanted, and missing by very small margins. Now here in 2014, I lost to him on the first day of the semifinals-qualifying portion but finished 1st while he finished 2nd, then I won my semifinal 2-0, and I won the first game of the best of three finals. 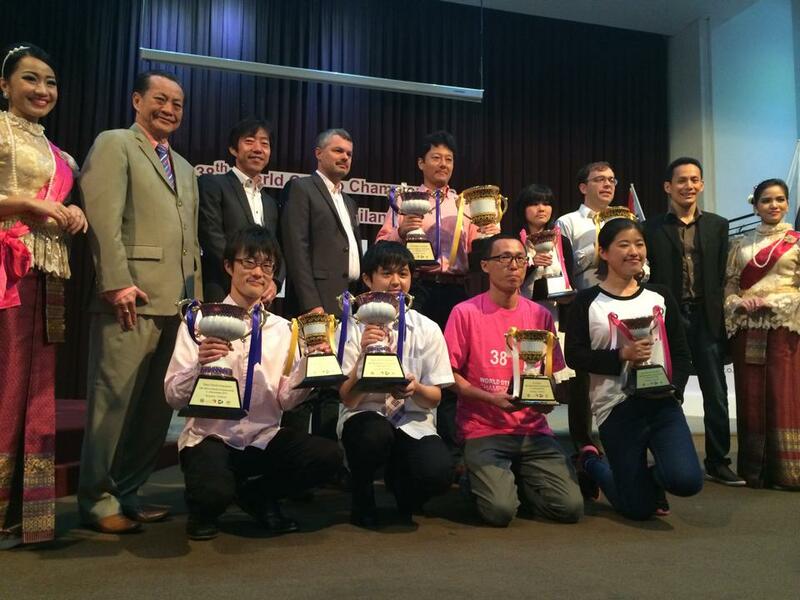 So, for Seeley to win this world championship, and Suekuni to finish 2nd, it seemed like the pattern of destiny, you know? But then... Makoto Suekuni showed what it can be like to not give up, and to finally break a pattern even after 17 years of disappointment. He won the last two games in strong style- his moves were at a level which is about as strong as a world-class player ever plays. His force field of determination was quite palpable. Even if I had been less sleep deprived (this was the worst for me since 2001), I think he still probably would have won those last two games. And after he won the 3rd game, I have almost never seen someone be so overwhelmed with relief and happiness- his tears were flowing in an uncontrollable way. I felt like I had a very muddy expression on my face, between my own personal disappointment and exhaustion, mixed with my feelings of empathy for just how damn good it can feel to reach the finish line after such an arduous journey, and how it must have felt especially sweet for him. I have always liked him, after all. And I have to be totally honest, I am prouder of my 2nd place in this tournament, than of either of my WOC victories. Based on the program analysis I have done, and how the games felt to me, this was the best overall tournament performance I have ever had. 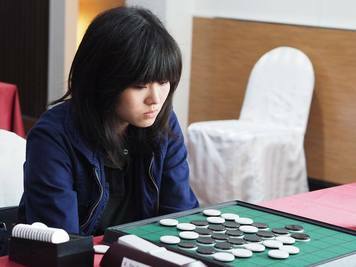 And, it was even harder for me to play this well, given the fact that the quality of the opponents was the toughest I have ever faced, and my bad luck with sleep added an extra dimension of difficulty. So, I'm really happy about my WOC performance, because I evaluate my performance against the degree of challenge. It's not my fault that Makoto played so well, and maybe if he hadn't been there I would have won . I also realized something about finishing 2nd, which I had never put my finger on before. When you win, you learn a lot about how much you have impressed people. When you finish 2nd, you learn a lot about how much people love you. I got so much support from people after the tournament was over, and it felt really damn nice! 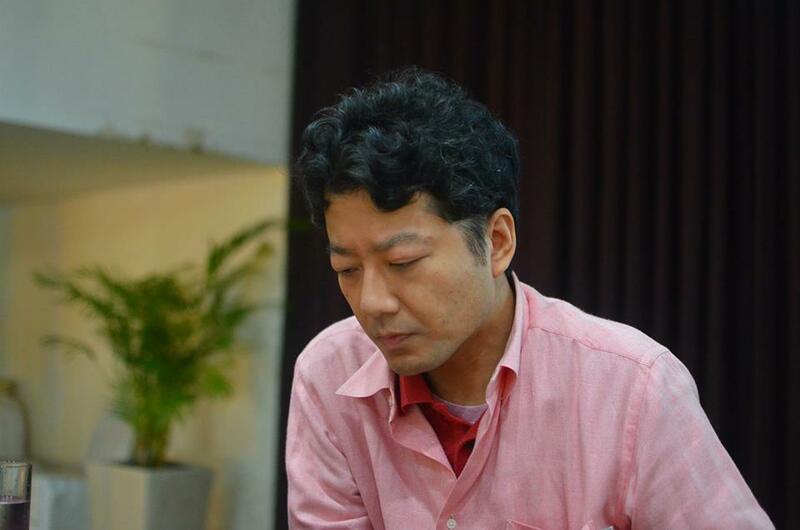 As Makoto told me earlier this year (after asking me about why I had taken a 5 year break from Othello tournaments), "I could never stop playing Othello, because Othello is my hometown". He hit the nail on the head. I have lots of friends from other walks of life, too, but Othello is still my hometown. Well, in a few hours I will fly back to Santa Barbara, the hometown my physical body lives in . At some point I will actually get around to posting some photos and writing about some other highlights and thoughts regarding the trip. Talk to you all later! My WOC 2014 experience was a fulfilling one which I managed to play almost every top player I wanted to challenge including the eventual champion Makoto Suekuni. 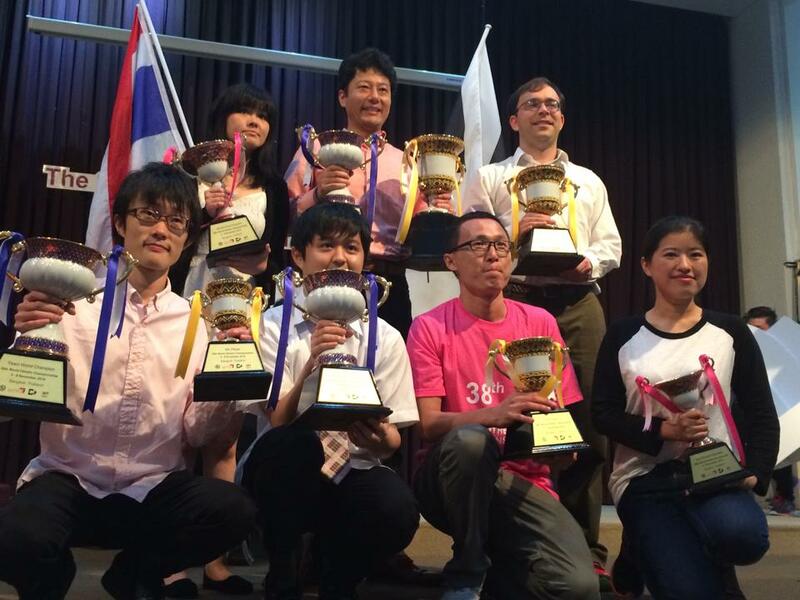 I think the tournament was the most comprehensive version of the event held so I really admire and give credit to the Thailand Othello association for bringing such a great experience to all players. Looking back on the tournament, I was really humbled by all the great players I met at the tournament and really seek to pursue greater heights in my Othello standards. 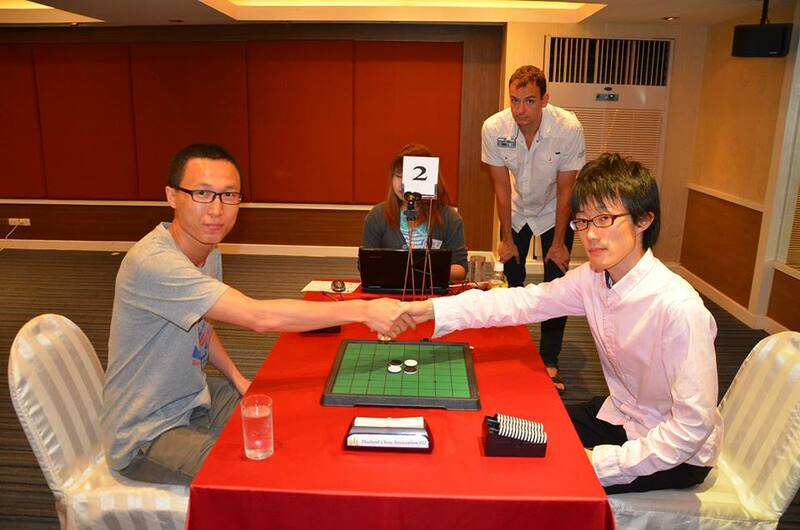 I was exceptionally proud of my team mate and room mate Chew Ching Wuen who scored six wins on the first day, especially playing a wonderful endgame to beat last years' champion Kazuki Okamoto in round 7 (not sure why he lost his magic on the second day though, haha no offense). I was also really amazed and proud of Sky Chong (who was able to get 0 discs in one game but also managed to score a victory over Nakano Jyou) and our teams overall performance because throughout the tournament, we had stuck closely behind the all time favourites team Japan up to the end of round 10 we were only behind them by 0.5 point. I was really disappointed in myself for not being able to contribute to Team SG by scoring a single point against any of the Japanese players and for pre-maturely giving up my dream to enter semi-finals when I had 7 points at the beginning of round 12 against my idol Nicky van den Biggelaar. Even though I felt I hadn't bothered to play much creative openings against him, but credit goes to him to securing the win firmly against me. It was only at round 13 had I realised that even if you had a bad start like Natsuke Aunchulee, you could still fight back if you don't give up. I admire his will to contest and fight his way to the playoff against Yan Song. Perhaps in my mind at the start of round 12, I had already had the mindset I was only destined for at most a top 10 finish and not being able to progress to day three felt a little meaningless.